Rain, red brick houses and fitted carpets, guess where I am…? …In northern England, more precisely in a small town called Darlington. 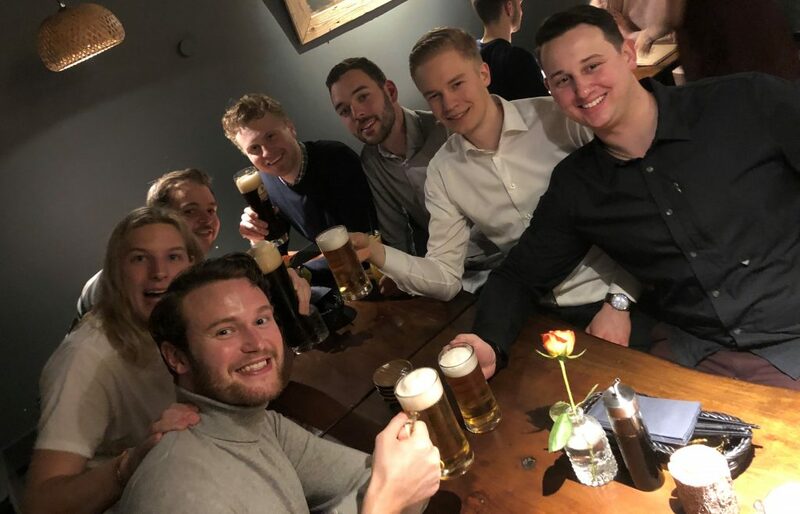 My name is Caroline Lilja, I’m a Global Trainee within Sourcing, and I moved here a week ago to start my second rotation in the UK Sourcing team. Very exciting! The last few weeks have been a lot about meeting new people and traveling. I have been in Germany for our second Training Module and as mentioned, I just moved to the UK for my second rotation. As you might know, between each rotation, we have a training week in one of Husqvarna Group’s main sites. This time we got to visit Ulm, Gardena’s headquarter. 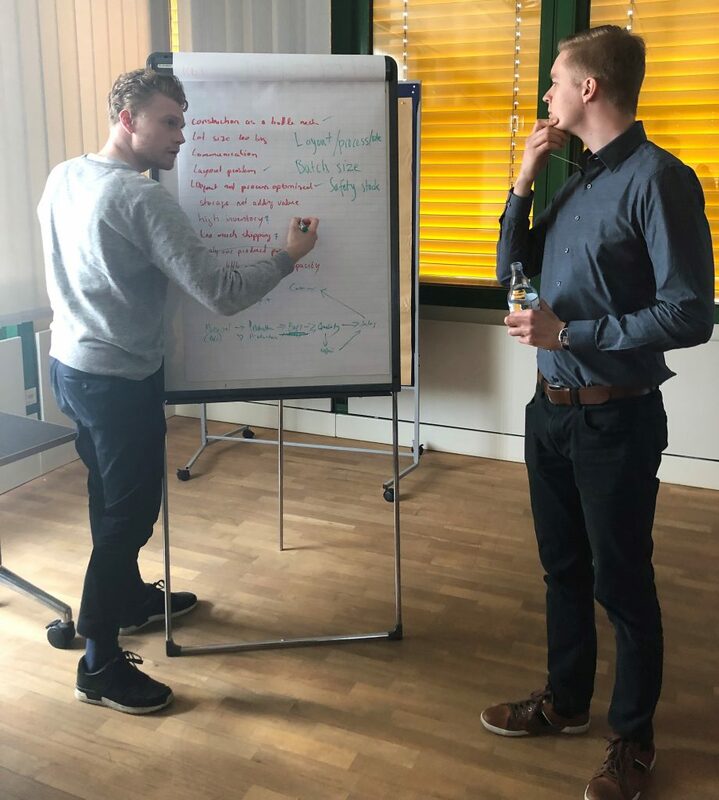 The module typically consists of a lot of interesting presentations from different areas within the company performed by senior managers, former trainees and other amazing colleagues. The week in Ulm also offered some practical exercises like Lego simulation, project management training and, last but not least, nice food and great company! The top two things during the week was according to me, the LEGO simulation and the cooking event. The LEGO simulation is a fun activity about continues improvements and we as a group did really well! It’s so much fun to work with bright and driven people! We also got the opportunity to challenge our ability to cooperate when we, one night, attended a cooking class. 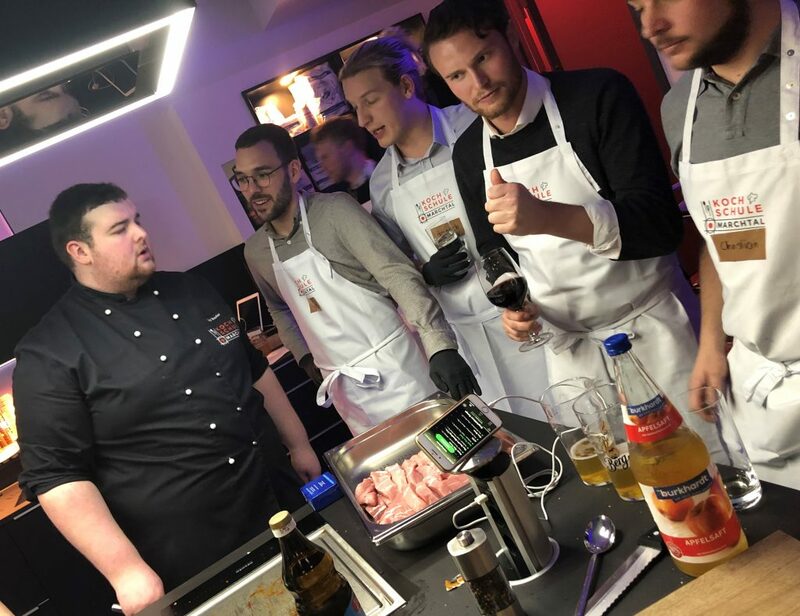 We were supposed to cook a three-course dinner for 15 people… But honestly speaking, I think the real chef cooked all the food and we just messed around in the kitchen ;). Happy team after the LEGO simulation! After the week in Ulm, I did a quick touch down in Sweden to finish up some work and then I went straight to the UK for my second rotation. In the UK we make, according to me, our coolest product. The robotic lawnmower! And wow! The UK office have really welcomed me and from day 1, I’ve felt like I’m a part of the team. Of course, it is a bit overwhelming to move to a new country, leaving the safe ground in Sweden to explore something new. But that really triggers me, and I think it’s good to step outside your comfort zone from time to time to experience new sides of yourself. Sometimes you just have to throw yourself into the unknown and see what happens. 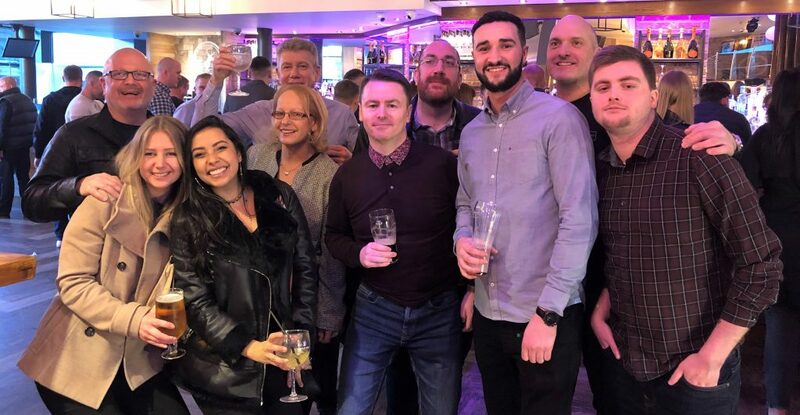 To wrap up my first week in the UK, I went out for a typical British pub crawl with my fantastic colleagues from the office, see picture below. 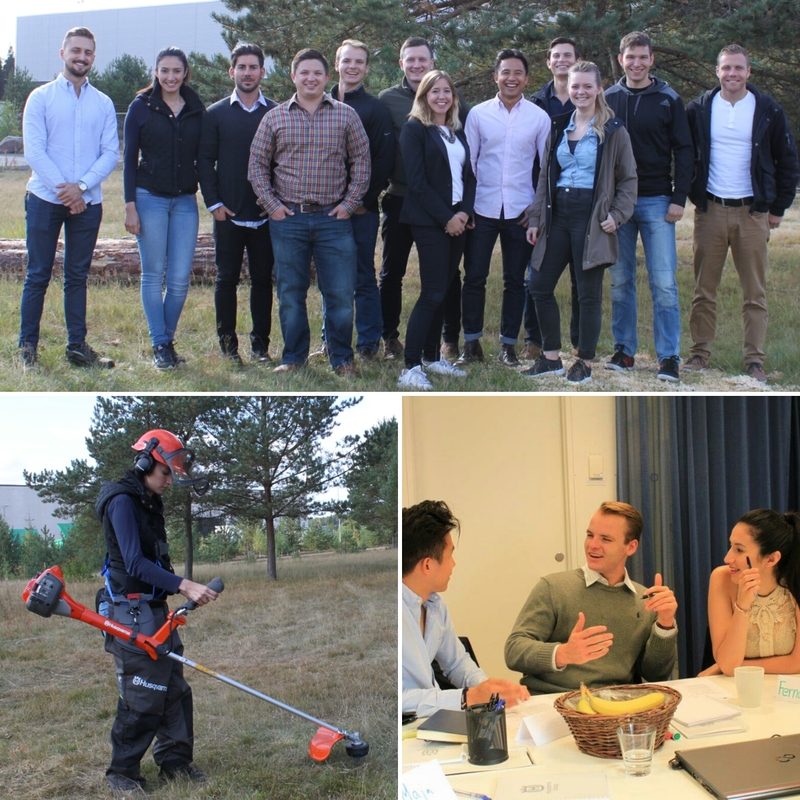 For me the trainee program is not just a great opportunity to develop my professional skills, I also get the possibility to travel around the world to learn from different cultures and to meet great new friends! This program gives me an opportunity to grow as a person and to step outside my comfort zone. Husqvarna Group is a company that understands how important it is for people to grow, not just professionally but as an individual. I’m so glad that I got this amazing opportunity. Until next time, take care :)! Olá para everyone! My name is Benjamin and I’m composing this small update from our factory located near the rainforest in Brazil. As a Global Trainee in SKF my new challenge is distributed across Latin America where I’m learning how we are handling our customer interaction and how to identify their needs, my next stop is SKF Chile! Working at the software centre in Gothenburg, Sweden was for sure an exciting and challenging first rotation. As a mechanical engineer previously researching robotics, my jar was empty, but to be challenged in a true agile environment suited me well. I had the opportunity take a Product Owner Certificate which helped me to assist the development of the agile framework. To receive such working experience and have the possibilities to challenge the status quo in such a big global company is very exciting! Managing the SKF Remote Presence had for sure been the most challenging and developing part of my journey, and still is. I’m fortunate enough to be working with state of the art technologies within digital communication, augmented and virtual reality. This technologies is used to enhance the internal and external communication. Example: the reduction of cost/time related to travel, and the increase of the operation up-time by solving disturbances faster. I consider this to be of key importance for a more efficient and sustainable future. Mitt namn är Monir Khan, 25 år och boende i Jönköping. Jag har en kandidatexamen i mjukvaruutveckling från Högskolan Kristianstad och jag har läst ett antal kurser inom mjukvaruutveckling på Kungliga Tekniska högskolan. Min passion är att utveckla applikationer som sticker ut på IT-marknaden när det gäller kreativitet, affärsnytta och prestandaeffektivitet. Mina största intressen är teknik, sport, meditation och anime-serier. Som person är jag nyfiken, pratsam och sällskaplig. På fritiden tycker jag om att umgås med vänner och familj, titta på youtube samt anime-serier, promenera i naturen eller läsa tidning. Jag är alltid redo för sport, humanitära aktiviteter och äventyr av alla slag. Det har snart gått två veckor sedan starten av traineeprogrammet. Jag känner redan nu att man trivs otroligt bra och att man känner sig välkommen här. Mina trainee-kamrater är trevliga och vi har en bra sammanhållning i gruppen tycker jag. Vi fick mycket hjälp från vår handledargrupp, faddrarna, programkoordinator och chefer från olika avdelningar och jag ser fram emot att lära mig mer av deras erfarenheter inom Jordbruksverket och IT-branschen. Jag ser fram emot resten av traineeperioden! Whenever we thought about a trainee program the first definition on our minds could be “development and challenge”. I can say that after almost 6 months as a Global Trainee in such an international organization those 2 Worlds are just the beginning to start describing the full experience this has represented for me. Every day I feel like taking advantage of new learning possibilities I may face during meetings, projects, ideas, or small talks I may have with my colleagues, I feel this 2 years are running so fast and we need to appreciate and take every challenge as an opportunity to be better tomorrow. Yesterday I was starting my first rotation, meeting all the trainees in the different functions and taking our introduction module together. Today they are already excellent friends, we have shared a lot of fun activities and I am closing this first part to begin the second assignment with the same or even more enthusiasm as the first one. Only thing left to say is “Enjoy every day of this experience, because soon we will be looking behind us and see how much we have grown from it”. 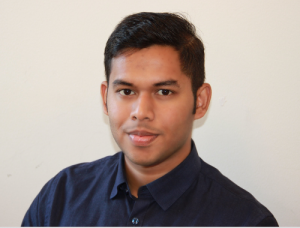 I spent my first three-month trainee placement at my home department: Marketing Communications. 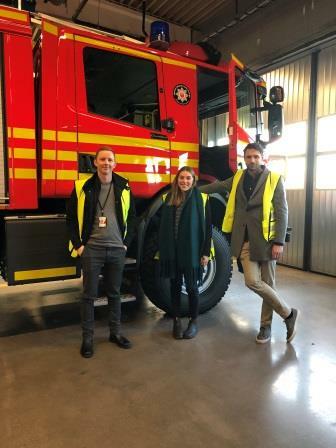 The main responsibility of this department is to develop global marketing communication strategies for trucks, buses, engines, services, and parts. The strategies are, then, transformed into tactical marketing activities and tools, such as web campaign sites, brochures, advertisements, direct marketing material, videos, promotional items and graphical guidelines for marketing communication material. 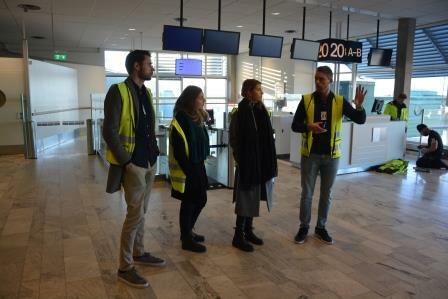 A typical activity is the preparation for international trade fairs, such as the IAA in Hanover, the IFAT in Munich, the Dubai International Boat Show or Busworld in Kortrijk. Another main task at Marketing Communications is to continuously update the brochures of our products and services. However, my very first marketing project was a little bit different: I was responsible for coordinating the production of the Scania 125 year campaign book. This year, Scania celebrates its 125th anniversary and many activities are planned throughout the year 2016 in order to celebrate this special occasion. The campaign book summarizes the background, marketing strategy, core message, and target groups for the Scania 125 year project. Furthermore, it provides an overview over the marketing material that is being produced for the anniversary, such as posters, roll-ups, videos, promotional items etc.. I realized very quickly, that the daily work at Scania is very cross-functional. This was no different with my project. In order to coordinate the project, I had to meet with various departments at Scania to collect all information necessary for the campaign book. Hence, I met with colleagues from the department of Corporate Relations, Event & Exhibition, Employer Branding, Parts & Services (Vehicle Accessories and Branding Products) and Business Support (Image Desk). We decided to develop a Scania 125 year logotype in different variations, which was then printed on different promotional items, such as flags, T-shirts, umbrellas, key rings, mouse pads, pins, pens, mugs, balloons, and chocolate. Furthermore, we designed posters, roll ups, wall banners, and produced a video together with an external advertising agency. Once the campaign book was written, it was published internally to all Scania distributors in the world. The distributors could, then, decide by themselves which marketing material they want to use locally in order to celebrate Scania’s 125th anniversary. All of us trainees have spent a period abroad at a Scania distributor this year. I always got very excited when my trainee colleagues sent me pictures of Scania 125 year marketing material that is used at a Scania distributor, for instance, in Brazil or Holland. It is great to see that the marketing material, which I helped to design, is used all over the world to celebrate Scania’s 125th anniversary! 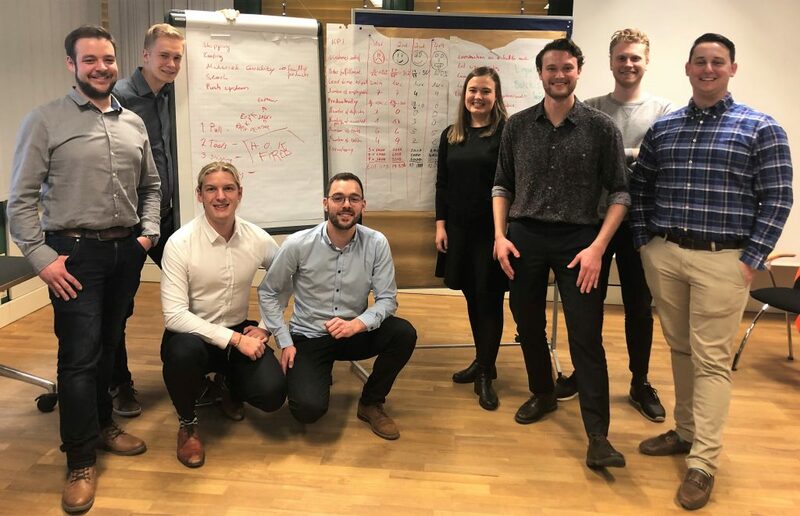 The three-week workshop practice, which is part of the six-week introductory program at Scania, was one of the activities that I had been looking forward to the most since I signed my working contract with Scania. It takes place in August and September each year and is part of the introduction program for the newly recruited trainees. There are three production facilities in Södertälje: bus and truck chassis, axels and gearboxes, and engines. The aim of the workshop practice is to obtain first-hand experience of how Scania’s products are assembled and to get an insight into the daily work flow at the production lines. Due to safety reasons, the regulations concerning what clothes or shoes to wear when working at the assembly lines are very strict. Therefore, each trainee was given a pair of safety shoes on our first day at Scania. Furthermore, we all received a workshop outfit, consisting of work trousers, T-shirts and a sweater. I still remember the moment, when I entered the chassis production facility for the first time. There was so much happening simultaneously that I did not know where to look first. The factory was surprisingly clean and light, all components were perfectly organized on the shelves, and every single step along the assembly line was precisely structured and planned in great detail. When walking through the production hall, you had to make sure to stay within the yellow lines, which are drawn on the floor, since there are so many small trucks, such as forklift trucks, driving around in order to supply the different workshop stations with new material. Thus, one of the first rules we learned was that these trucks were always allowed to go first. Wearing the Scania outfit that we were given earlier, we trainees were dressed in the exact same way as all the other assemblers at the production line. Even the workshop managers all the way up to the plant manager wore at least the beige Scania T-shirt. This is, again, a typical example, that shows Scania’s unique organizational culture, where everybody – from the assembler to the top manager – feels like being part of one big family. When I was at the chassis assembly line, I worked with the team that put the engines into the bus chassis. I was surprised by the fact that a lot of work is still performed manually, for example, pushing the chassis from one work station to the next at the end of each tact time. The tools that are used in the chassis production are very heavy and not so easy to handle and it was exhausting to stand up during the entire day. Thus, my feet and shoulders hurt quite a bit when I got home from work. During my second week of workshop practice, I was at the rear axle assembly line. The tact time, which is the time spent on each unit, is a lot shorter compared to the bus chassis production. Furthermore, since the rotation of an axle from one work station to the next is completely automated, every movement is prescribed in detail and has to be followed strictly. In addition, taking a break for drinking a sip of water, eating a snack or going to the restroom is steered by the tact time. However, the workshop practice has been a very valuable experience for me. From day one, I felt like being part of the team and the assemblers were very patient and thorough when they taught me their tasks. The production facilities are really “the heart of Scania” and I have even more respect for the Scania assemblers, who are standing at the production lines every single day, now, after I have worked there myself. The assemblers’ dedication and commitment to Scania is truly exceptional and is definitely one of the reasons why Scania can retain such a high level of quality in its products. The trainee program at Scania started in August with a six-week introductory program. Three of the six weeks were filled with lectures, seminars, and various other activities. On one of the first days at Scania, we visited the Scania DemoCentre in Södertälje. The DemoCentre is Scania’s showroom where you can test drive different Scania products. More than fourteen thousand visitors from around the world come to the DemoCentre each year. Among them are representatives of major customers such as local councils, fire services, and the military, as well as international politicians. A wide range of vehicles can be tested on the test track – from distribution trucks to 25.25-metre rigs to hybrid Scania buses. The trucks are fully loaded and most of them are available in truck and trailer combinations. There is a Demodriver for each truck and bus who provides technical information and driving advice. Having never driven a truck before, I was very excited when I climbed into the driver’s cabin of one of the Scania trucks for the first time. It was an amazing feeling sitting high up in such a heavy and robust vehicle and experiencing the power of the V8 engine, when the truck easily mastered a steep hill on the test track. I also test drove a hybrid Scania bus, which was quite a unique experience, too. Another highlight of the introduction weeks was that we got to meet all executive board members including the CEO. 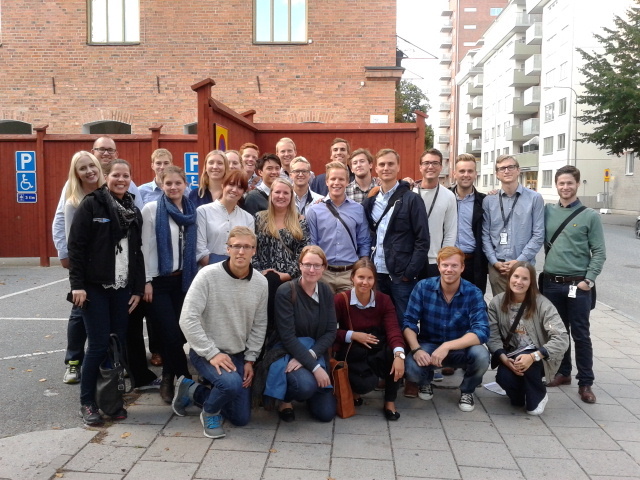 One of the seminars that we attended during the introduction weeks, was an intercultural training, where we learned more about the differences between the Swedish and German business cultures. German companies, for instance, tend to be more hierarchical, whereas consensus decision-making is very important for Swedish companies. Being aware of such cultural differences is crucial for successful German-Swedish business relations. Since the collaboration between Scania and MAN has intensified after Scania became part of the Volkswagen Group, understanding the German corporate culture has become essential for Scania. It is very important for Scania that its employees have an appropriate work-life balance. Therefore, Scania motivates its employees to take a break from work once in a while in order to attend one of the gym classes that are offered at the Scania Health Center or to work out at the Scania gym. Hence, we trainees got the opportunity to test a Kettlebells class at the health center, which was a lot of fun. 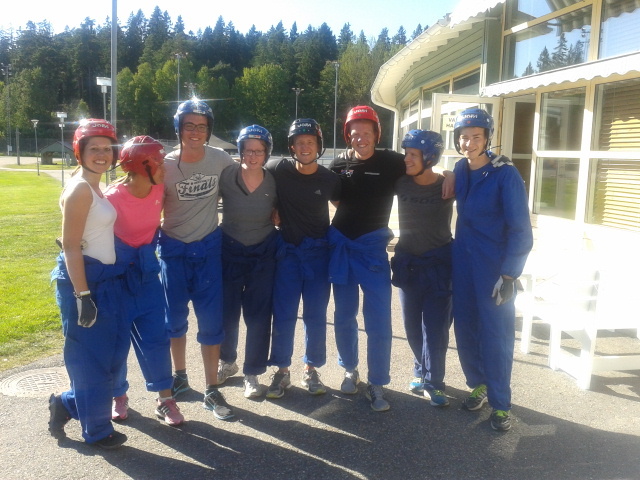 On one of the weekends during the introduction weeks, we travelled to Barnens Ö together with the trainees from the year 2014/15. Barnens Ö is an island north of Stockholm and we stayed in a Swedish cottage directly at the water, where we celebrated a typical Swedish “kräftskiva” (crayfish party). It was also a great opportunity to get to know the former trainees and to ask them questions about their journey at Scania. The activities mentioned above are only some of the highlights of the introduction weeks. Another highlight was definitely the three weeks that we spent at the Scania assembly lines, which I will write more about in my next blog entry. In the morning of my very first work day in August 2015, I drove to the Scania headquarters, nervous and excited to meet the other trainees. The only information that I had gotten was what place and time I should be there and that I should take sports clothes with me for an outdoor activity. The meeting point was the Scania museum, where the trainees of 2015 gathered to start the day with a Fika. In 2015, Scania hired 26 trainees (10 female and 16 male trainees), all of them recent university graduates with a maximum of one year’s working experience. The trainees had been recruited by different functional departments; hence we are nine Production trainees, six within R&D, two in Sales & Marketing, two in Commercial Operations, two in Purchasing, two in Business Control, two in Finance, and one in IT. Besides me, there is one other trainee, who is originally from Germany, as well as one trainee from Estonia, while the rest of the trainees are Swedes. On that first day at Scania, it was very easy to start a conversation with the other trainees. It seemed like we were on the same wavelength, since we all have similar backgrounds and are rather outgoing people who like to socialize. 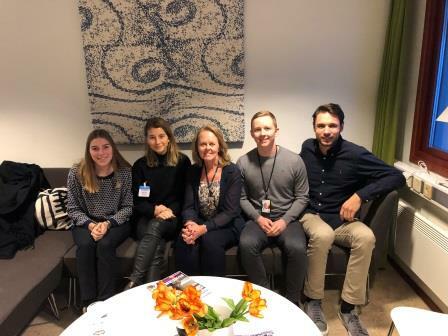 After the Fika, we were welcomed by the trainee coordinators, who gave us more information on the structure of the introductory program and the trainee program as a whole. In the afternoon, we went to Scania’s own health and fitness club, which is just a few minutes’ drive away from Scania’s headquarters. We were asked to change to our sportswear and to put on a blue work overall and helmet. Putting on the helmet, we became a little anxious what Scania had in store for us. What followed was an outside teambuilding activity, during which we had to execute different tasks and solve problems in smaller teams. The weather was beautiful and it was a lot of fun and definitely helped us trainees to get to know each other better as well as bond as a team. In the evening, I was exhausted from all the new impressions that I had gained on that first day, but I was also very happy to be part of such a nice group of trainees and excited to go back to work the next day in order to continue the trainee journey together with the other trainees.